Place 2 large rectangles of aluminium foil on top of each other. Fold up the edges of your double layered aluminium foil to create a tray shape which could retain liquid. Inside the aluminium foil tray place the basil leaves on the bottom, followed by the prawns and cherry tomatoes, then the cockles. In a small bowl mix the white wine with the tomato paste and olive oil, and pour this over the shellfish. Ensure none of the liquid can escape. Fold in the edges of the parcel ensuring there are no gaps to allow steam to escape. For the toast, drizzle the olive oil on to both side of the sourdough bread and toast on the grill, when toasted both sides rub with whole garlic clove to taste. 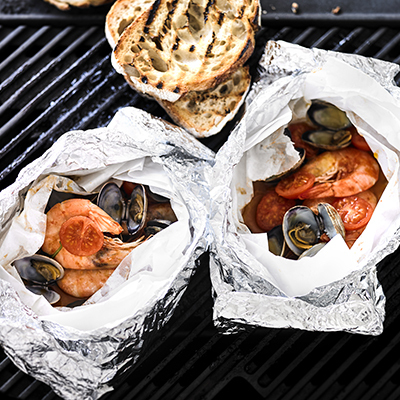 To cook the papillote, place on a preheated Force BBQ set to low, and close the lid. Cook for approximately 5 minutes or until the shellfish is cooked through and the cockles have opened. Remove the papillote from the BBQ and open the parcels carefully (the steam will be very hot once opened) and arrange the contents of each parcel on top of the sourdough slices.